The light, refreshing taste of Ontario craft ciders is in hot demand across the province – and Ontario apple and cider producers are working to quench that consumer thirst just as quickly as their trees will grow and bear fruit. 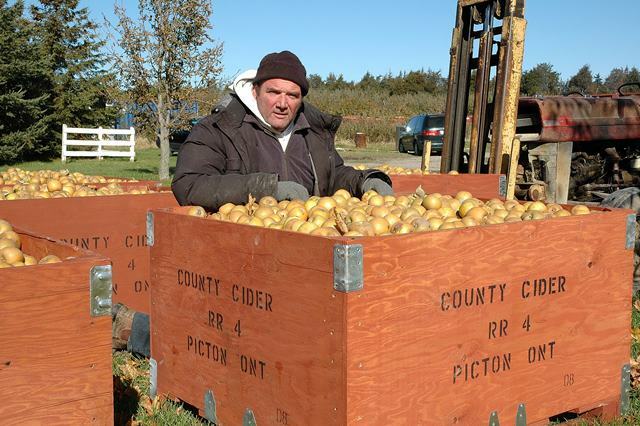 One of the pioneers of Ontario’s craft cider industry is The County Cider Company in picturesque Prince Edward County, which opened its doors 19 years ago with its first 600 litres of the locally produced apple beverage. It quickly sold out and owner Grant Howes says they haven’t looked back since. His parents first bought the apple orchard in the 1970s, a farm where apples have been grown for over 150 years, and grew many well-known varieties like Empire, Idared and Spartan. It was during a stint working out west that he discovered the hard apple cider that set the family business on a new course. Hard apple cider is a fermented alcoholic drink; by comparison, sweet apple cider, which is widely produced in Ontario, is an unfiltered, unsweetened non-alcoholic beverage. He returned home and began working on different cider formulations using apples from the family orchard, launching the cidery in 1995. The growth that followed was exponential and in 2002, the family ended its pick your own business to put 100 per cent of their crop into cider production. “We’d gone from being an apple orchard with a cidery to a cidery with an apple orchard,” Howes says. Most traditional Ontario apple varieties make a great base for ciders, including Spartan, McIntosh, Empire, Golden Russet and Northern Spy, as they have high acid levels. Newer varieties like Honey Crisp and Ambrosia are less suitable due to their higher sugar content. Howes has also been working on propagating rare apple cider varieties from England and France, such as Bulmer’s Norman, Michelin and Dabinet that are the mainstays of Europe’s cider production. An added benefit from the transition to growing apples for hard cider production for Howes has been the reduced environmental footprint of his operation. Small apples full of flavour are ideal, so he is using less water for growing. As well, Howes says they’re now using 70 per cent fewer crop protection materials than they were 20 years ago; because the apples are being processed, small blemishes and insect bites won’t decrease the value of his crop the way it can for fresh market fruit. The County Cider Company is best known for its Waupoos and County Cider beverages, although they also produce non-alcoholic sparkling and fruit-flavoured ciders. Their products are sold through their on-site store and about 150 Ontario bars and restaurants have Waupoos cider on draft. In the summer in the Prince Edward County region they outsell some popular beers, Howes says and every year they seem to sell out, even though they are increasing their production 30 to 40 per cent per year. Waupoos and County Cider are also sold through the LCBO, but Howes admits that even though Ontario has gone from three cideries two years ago to 14 in 2014, distribution is a problem for the burgeoning industry. Looking to the future, Howes is preparing to launch a pear cider this year and has also started producing some new ciders made from the traditional cider apple varieties he has been experimenting with. The success of their Tortured Path cider, which sold out in six weeks last year, has helped validate the work they’ve been doing growing the “weird varietals”, he says. “Our trees dictate how quickly we can grow, which keeps us well-grounded and we’ll just continue to plant the apples,” he says. To learn more about The County Cider Company, visit www.countycider.com. Written by Lilian Schaer for Ontario Apple Growers. Photo courtesy of Grant Howes, The County Cider Company.